Novation's Remote LE range offers a healthy selection of features from their popular Remote controller keyboards at a cut-down price. Remote LE is the name of a new range of MIDI and USB controller keyboards from Novation, offering affordable, cut-down versions of the popular Remote keyboards, as favourably reviewed by Messrs. Johnson and Poyser way back in the August 2003 issue of SOS. As with the Remote range 'proper', there are three different LE keyboards, all essentially identical except for size and number of keys. You can choose between 61 keys (five octaves, in a case measuring 963mm by 278mm), which costs £179, 49 keys (four octaves; 798mm by 278mm) at £159, or 25 keys (two octaves; 468mm by 278mm) for £119. The larger models are likely to appeal to the more technically proficient ivory-ticklers. The smaller version might be well suited to sample triggering and sequence programming without the virtuoso flourishes. For this review I've been looking at the diminutive 25 key version, which really is impressively compact — occupying no more desk space than the QWERTY keyboard I'm typing this on. Although the LE range is the budget option in Novation's catalogue, they don't come across as 'cheap and cheerful' at all. Unpacking the keyboard, I was struck not only by its sleek design, but also by the reassuringly sturdy feel of the thing. The case is plastic (and so would still need to be handled with a reasonable amount of care in a gig situation), but the overall impression is of a well-built, durable keyboard, rather than a flimsy, mass-produced computer peripheral. Despite being, on the face of it, a simplified and cut-down version of its more illustrious sibling, the Remote LE is still quite impressively furnished with buttons, knobs and the like. Along the top of the keyboard are nine knobs, whose functions vary depending on the 'template' used (more on templates later). Beneath these knobs is a row of nine buttons, with similarly variable functions. A tenth button is used to select a second 'control group'; ie. it acts as a kind of Shift key which can be toggled on and off, with each knob and button having a different function assigned when it's activated. On the back panel there's a standard USB port for connecting to a host computer, a single MIDI out, a socket for attaching an optional 9V mains adapter, a socket for connecting a sustain pedal, and a power switch.Photo: Mike CameronTo the right is a set of transport buttons (Rewind, Fast Forward, Loop, Stop, Play and Record), which can be mapped to your sequencer's transport controls, potentially saving quite a few mouse clicks. If you don't need transport controls, the buttons can be assigned other parameters to control. To the left are four 'Mode Select' buttons (Edit, Write, Global and Play), and a pair of buttons to shift the keyboard range one or more octaves up or down (the entire range of MIDI notes is accessible). There's also a two-row, 16-character LCD, handsomely back-lit by a blue LED, which displays various kinds of pertinent information (template names, MIDI parameter values and so on). Alongside sits a 10th knob, in this case a 'rotary encoder' (ie. it's incremental, and can be turned in both directions without stopping at either extreme). This is used to change templates, send MIDI program change messages, and so on. A nicely designed joystick combines pitch-bend and modulation in one place. Moving the joystick left or right performs pitch-bends; backwards or forwards sends mod-wheel data; diagonal or circular movements allow both to be sent simultaneously. Beneath is a rather nice X/Y touchpad — much like that on a laptop, — which can have up to four different target parameters assigned at once; two for the horizontal axis, and two for the vertical. This allows a large amount of creative control over your favourite hardware or software; just pick four parameters and start experimenting! Assigning parameters to the touchpad is easy; in edit mode, the pad is divided into four 'quadrants', one for each parameter. To assign a parameter to 'X1' (the first of the two horizontal axis control sources) simply press and hold in the top-left quadrant, and the relevant parameter details appear in the LCD display, where they can be edited. You also have a good deal of control over how the touchpad behaves. The 'No Spring', 'Spring Left' and 'Spring Centre' modes allow you to choose what happens (to parameters assigned to the X axis) when a finger is removed from the touchpad. In the first case, affected parameters stop at their last value; in the second they jump all the way to the left of the square (to zero); in the third they jump to the centre. The most important feature is the keyboard itself, and Novation have really come up with the goods here. Although it's not exactly the same as the keyboard used in the more expensive Remote models, it seems to be of a broadly similar design, and is described as 'semi-weighted'. I'm not sure exactly how that's implemented in practice (it's not a hammer-action mechanism), but whatever it is works well. The keys do feel like they have a bit of 'weight' to them, and spring back positively when released. The keyboard is nicely responsive to velocity, and you have a choice of eight different 'velocity curves' to fine-tune that response. Overall it feels well-made, comfortable and very playable. The only thing it's lacking is aftertouch sensitivity — if this is a 'must-have' for you, you'll need to look at one of the standard Remote models instead (see the 'What's The Difference?' box on the next page). Note that you can assign aftertouch data to another control source, such as the X/Y touchpad. 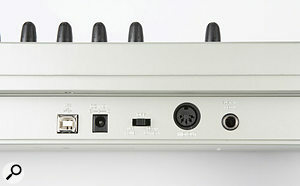 On the back panel there's a standard USB port for connecting to a host computer, a single MIDI out, a socket for attaching an optional 9V mains adapter, a socket for connecting a sustain pedal, and a power switch. The power switch is slightly unusual in that it has three positions, the centre being 'off'. Flick the switch one way and the LE is powered either by batteries (six standard AA's) or the aforementioned optional mains adapter. Flick it the other way and power will be drawn from the USB port of the host computer, assuming sufficient power is available (it may, or may not be, depending on your computer and other USB peripherals). It's worth bearing in mind that you can use both the MIDI and USB port simultaneously, to control a mixture of hardware devices and software programs. Even if your primary sound source is a hardware module you may still be able to use your computer's USB port as a convenient power source (which could save a few quid in batteries). Plug & Play — Really! A printed addendum to the manual announces that 'Remote LE is now class compliant', and urges you to ignore the driver installations instructions on page four. Sure enough, you can. Under Windows XP and Mac OS X (earlier operating systems are not supported) you can simply connect the keyboard to your computer via USB, and a moment later it will be ready to use. Somewhat confusingly, Windows insists that the LE is a 'USB audio device' (in spite of the fact that it has no audio capabilities), but this is considered normal and shouldn't cause any problems. Templates are the key to getting the best out of the Remote LE. A template is basically a patch or program: a collection of knob and button settings and controller assignments, along with joystick and touchpad settings. A number of preset templates are provided, tailored to suit the parameters of several popular instruments. When using the BassStation plug-in that comes bundled free with the LE, for example, you can simply select the ' BassStation ' template and the LE's knobs are instantly mapped to the appropriate BassStation parameters. When you want to control another instrument, just switch to the appropriate template. There are twelve default templates built-in, offering support for the Novation V-Station and BassStation, Reason Subtractor and Maelström, Native Instruments' FM7 and Pro53, GMedia Oddity, Spectrasonics Trilogy (or Stylus or Atmosphere), Ableton Live, a generic General MIDI device, Cubase, and Logic 7. Still more templates are available for download from the Novation web site. The full Remote LE range -- featuring 25-, 49- and 61-note keyboards.Photo: Mike CameronPaper overlays are supplied for the default templates, which can be placed over the knobs so that the appropriate parameter names are visible. This is a nice idea — although I found the overlays rather flimsy, prone to curling up at the ends, and a bit reluctant to lie flat. If you have a favourite instrument or two, however, you'll probably get used to where their parameters are assigned anyway. You aren't limited to using preset templates, of course. Templates can be created, edited and stored from the LE's front panel. All the important MIDI data types can be sent (CC, NRPN, RPN, MMC, Note On/Off, program change and so on) and, with a little careful editing, it should be possible to gain a useful degree of control over just about any MIDI-capable device or software in your studio. You're allowed a good deal of control over the way the knobs and buttons behave. For example, a knob sending MIDI continuous controller data can be set to either 'Pickup' mode (the knob only sends data once it has passed through the current value of the assigned parameter) or 'Jump' mode (the knob sends data immediately, causing the parameter to jump to a new value). Similarly, buttons can be set to work in one of four different modes. In 'Normal' mode a value is sent when a button is pressed, but not when it's released. In 'Momentary' mode one value is sent when the button is pressed, and a second value is sent when it's released. In 'Toggle' mode, pressing and releasing the button sends one value; pressing and releasing it again sends a second value; pressing and releasing it a third time sends the first value again, and so on. Finally, in 'Step' mode, each press and release of the button increases the sent value by an increment. Novation helpfully provide some simple-but-effective template editing software for Windows and OS X, which can be downloaded for free from their web site. This eases the business of creating, editing and storing templates considerably, and is a nice bonus. It's difficult to come up with any real complaints about the Remote LE. Overall, I'm just impressed by how much you get for your money. While it's always nice to have a few extra knobs available, Novation have done a good, sensible job of cramming the maximum amount of functionality into a compact and affordable package. The X/Y touchpad is a very nice feature to have in a keyboard of this price, as is the combined pitch and modulation joystick. The preset templates are convenient and useful, and creating new templates has probably been made as straightforward as it possibly could be. Last and not least, the keyboard itself is a pleasure to play, and manages to feel much more 'expensive' than it really is. Novation has three different product ranges all bearing the 'Remote' name. The impressive-looking, high-end Remote SL keyboards have the most whistles and bells, including two large LCDs and the rather clever 'Automapping' system, which received a resounding thumbs up from Derek Johnson in the February 2006 issue of SOS. The standard Remote range isn't lacking in the features department either, each model offering a total of 17 knobs (eight rotary pots and nine rotary encoders), along with eight assignable sliders, for plenty of hands-on control. They also have X/Y touchpads and a combined pitch-bend and modulation joystick. The LE range, reviewed here, closely resembles the standard Remote range, but with a few important cost-cutting differences. The first and most obvious is that there are no sliders at all. There are also only 10 knobs (nine 'pots', one 'encoder'). The touchpad is included however, which is a bonus for a controller of this price. Also, although the 'LE' keyboard is of a similar 'semi-weighted' design as the Remote range 'proper', it's not identical, and does not provide aftertouch sensitivity. This may or may not bother you. The pitch-bend and modulation joystick is here, but with a slight difference. On the standard Remote models the spring-loaded mechanism can be disengaged for backward-and-forward modulation movements, if that's what you prefer. On the 'LE' models it's fixed, so the joystick sits all the way back when at rest, and always springs back when released. Finally, while the standard Remote models offer a comprehensive set of MIDI ports (one In, one Thru and two Outs), the LE models have just a single MIDI Out. Both the standard and LE ranges feature a single USB port, for connecting to a computer without the need for a MIDI interface. Easy editing of custom templates. X/Y touchpad and pitch/modulation joystick. The Remote LE range offers an impressive set of features, including a very playable keyboard, all for a very reasonable price. There are some pretty respectable competitors on the same turf (Edirol's PCR-M1 and the M Audio Oxygen, for example), but these newest offerings from Novation can more than hold their own against the opposition. Remote 25 LE £119; Remote 49 LE £159; Remote 61 LE £179. Prices include VAT.